I had wanted to see Avenue Q for a number of years...on a few visits to New York City, when I lived in Washington, DC, and even since I've been back in Atlanta. I'd heard approximately a bazillion positive comments about the show...and now I understand why so many love it. And why it's a Tony Award and Suzi Award-winning show! But it's so much more than what I was expecting...it goes in a lot of different directions, but with a singular destination. Avenue Q is terrifically funny, delightfully romantic and more than a little risque...it serves as a map that leads to understanding life's purpose. That last part may sound a little heavy, but you're going to have so much fun getting there, and perhaps experience an epiphany or two along the way. AND you have the opportunity to see it at two venues! My favorite characters? The entire cast is absolutely amazing. Seriously. They're seriously funny and incredibly talented. But, character-wise—keeping in mind that the characters are puppets AND humans—I was side-splitting cracking up at the Bad Idea Bears. We've all had encounters with them—don't deny it—and now I know what to call them! Just hopefully not calling on them as often as I did in my 20s. I felt like I could relate to Princeton (performed by Nick Arapoglou, winner of a Suzi Bass Award for Best Lead Actor in a Musical, in Avenue Q). Princeton has had the revelation that there's purpose in life, but he kind of misses out on (part of) life while looking for it. The story is more complex than that though. If you've lived life, you just might recognize some of his predicaments. I know I did. Christmas Eve...was a total and wonderful surprise! For those who think Christmas Eve is the day before one of the biggest holidays of the year, think again. Think in terms of hilarious, loud (she projects well), demanding, forthcoming, frank, direct and telling-it-like-it-is! 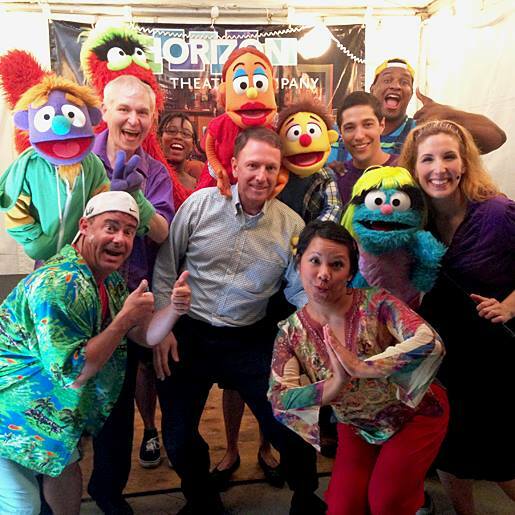 Meet the awesome Natalie Gray, who is reprising her role in Avenue Q. That's her in the foreground of the above photo...she's amazing! The entire cast is fantastic...they seem like they'd be great fun to hang out with! "Avenue Q is about finding your purpose in life—whether you are young or old, gay or straight, yellow, red or blue. It fits perfectly with Horizon's mission of connecting Atlantans through smart, positive, provocative contemporary theater that speaks to our diverse community." I'm always impressed when I see a leader of an Atlanta attraction who is totally engaged and involved. Lisa Adler, the co-founder and Co-Artistic/Producing Director of Horizon Theatre, not only introduced the show, she was there after the show helping theatre-goers get photos with the cast...that's totally awesome. Lisa is one of Atlanta's gems! There are a couple more days to see the "PG-13 Edition" at the Promenade in Piedmont Park—very near Atlanta Botanical Garden, where Legacy Fountain is located. You can even bring your own picnic! Remember to bring blankets or low beach chairs. There is reserved seating—at the front—for $15 plus tax and fees, and there may still be some free tickets. Those are great too...the show is on a full-size stage! The PG-13 version maintains the basic story line and the comedy of the original, but is edited for content to make it appropriate for teenagers. But take note...neither production is intended for young children. Personally, I can hardly wait to see the "Adult Version"! Described as a "politically incorrect cross between Sesame Street and The Simpsons".It's playing at Oglethorpe University's Conant Performing Arts Center Friday, June 12, 2015, through Sunday, July 12, 2015. I've been going to Oglethorpe University Museum of Art for years—love the Gothic Revival campus—but this will be my first time at Conant...can hardly wait! There will be a few "PG-13" performances at Conant, as well. Tickets are going FAST! If you want to see Avenue Q—and I think a LOT of you will—get your tickets now. I feel like I'm one of the last of my friends to see Avenue Q, but now I find myself among those who will see it every chance I get! I'd like to offer a special "Thank you" to BRAVE PR and Horizon Theatre for the tickets. The show is totally awesome and that's my own opinion! Finding "home", but first...a reverse striptease!